If you’re like most, you entered the field of HR to help people and empower them to do their best work. But the reality is HR spends most of their day on files, forms, processes, policies, workstreams—you get the idea. 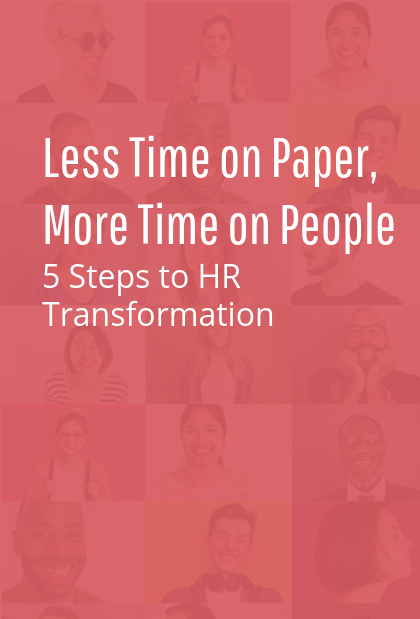 It’s time for an HR transformation. HR has the opportunity to reduce the time spent on administrative tasks and allocate it toward work that focuses on people. A lighter administrative burden means more time for initiatives that impact employee engagement, which has been linked to better business results. At a time when HR is expected to be more strategic, this contribution to the bottom line is invaluable. In this eBook, uncover the 5 biggest productivity killers for HR and what can be done to make these tasks run more efficiently. The result? HR spends less time on paper and more time on people. Get started today with our interactive eBook! Zero in on where HR spends too much time on manual, repetitive or inefficient tasks. Re-design key functions or processes so HR teams can work quickly and seamlessly. Reallocate saved time to work that directly impacts people, resulting in a better EX. Research shows that 41% of HR professionals’ time is spent on “transactional activities.” HR teams are trying hard to fix this...respondents told us they plan to reduce the transactional work in an effort to focus on people, culture, and the workplace. Fill out the form and instantly receive your interactive eBook! Start your HR transformation today!